In the public sector, the move toward AVoIP systems from matrix-based AV distribution systems is continuing to gain traction. Major concerns for local, state/province and national officials, is that their AV and communications systems perform at a high level and are reliable, as well as affordable, to fit within increasingly constrained budgets. AVoIP systems enable video to be distributed over a facility’s existing data network, which bypasses the need for a dedicated AV system. In addition, this approach offers open standard interoperability, which gives IT managers the freedom to shop and choose from a wider array of available gear, as well as a scalable architecture that allows for future system expansion without the need to replace existing equipment. These factors go a long way to providing both convenience and cost-effectiveness to new builds, as well as system upgrade projects. 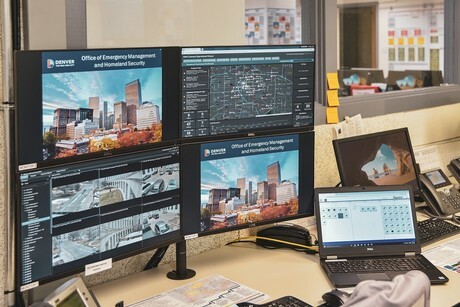 The benefits of AVoIP are illustrated in the following examples of two formidable AV system upgrades at emergency operations centres (EOCs) in the US. They feature IP encoders, decoders and control systems from one of our partner brands, ZeeVee — a global pioneer and leader in the development and deployment of AV distribution systems for industrial, commercial and residential applications. The City and County of Denver’s EOC serves more than 700,000 residents and a daytime population of more than one million people. It is designed to support all types of emergencies, including natural events (winter storms, flooding and tornadoes), human-caused events (dam failures, electrical failures and terrorism-related incidents), and special events (parades, inauguration ceremonies and sporting events). The facility’s previous system, which utilised a 32-input/32-output matrix switch to route video and audio from computers to television screens, had been in place for more than a decade — long before high definition (HD) displays became the standard. In addition, it was no longer supported by the manufacturer — making it increasingly harder to find replacement parts and adapters. The new AVoIP system employs two 48-port switches, 36 ZeeVee ZyPer4K encoders, 25 ZyPer4K decoders, and three Chromebooks to control the ZeeVee MaestroZ software that seamlessly distributes computer content, television stations, CCTV feeds, PowerPoint presentations and websites, to displays throughout the facility. Above and beyond its performance and reliability in transmitting situational awareness information to EOC staffers and first responders, the system offers a great deal of flexibility and allows them to quickly reconfigure inputs and outputs to meet the unique needs of each EOC activation. The Nez Perce County emergency operations centre staff, which serves a population of just over 40,000, also recently conducted an overhaul to elevate its AV and communications capacities to be more efficient and effective. It brought in an AVoIP system that featured 15 ZeeVee ZyPerHD encoders and decoders, and a Z4KMP48 ZeeVee Management Platform, which was quickly installed once the key components were successfully tested. County officials were impressed with how easy system expansion proved to be with the AVoIP-based system, as it did not require vendor assistance to make changes or install new devices. Denver and Nez Perce County officials are very pleased and proud of the new AV and communications systems that were created for their communities. The approach, which implements high-performance gear that stays within budget, will make it possible to better assist the community in times of crisis, and easily adapt the system as necessary to meet new requirements and challenges as they arise. ZeeVee AVoIP products have been generating a great deal of industry buzz and earning accolades, including an ISE 2019 InAVation Award and an AVTechnology InfoComm 2018 Best of Show Award for its ZyPerMX4 four-channel IP encoder. Audio Visual Distributors Pty Ltd represent ZeeVee in government and other sectors throughout Australia and New Zealand. We have been distributing and supporting AVoIP systems for over 10 years. This experience from the very beginning of these IP based solutions has led to a vast knowledge of the requirements of commercial networks, nuances of the product and generally how video works on a network. Our support teams have been fully trained by ZeeVee and offer local support on the 10Gb, 1Gb and compressed video distributions systems available from ZeeVee. These units are stocked locally in our warehouse in Queensland and readily available for projects with our integration partners. Next generation mobile intelligence: What does mobility really mean for public safety agencies?